We are packing our gear and cleaning the cabin! Jennie and I head back to the mainland today and we wanted to give you one last update on our season. 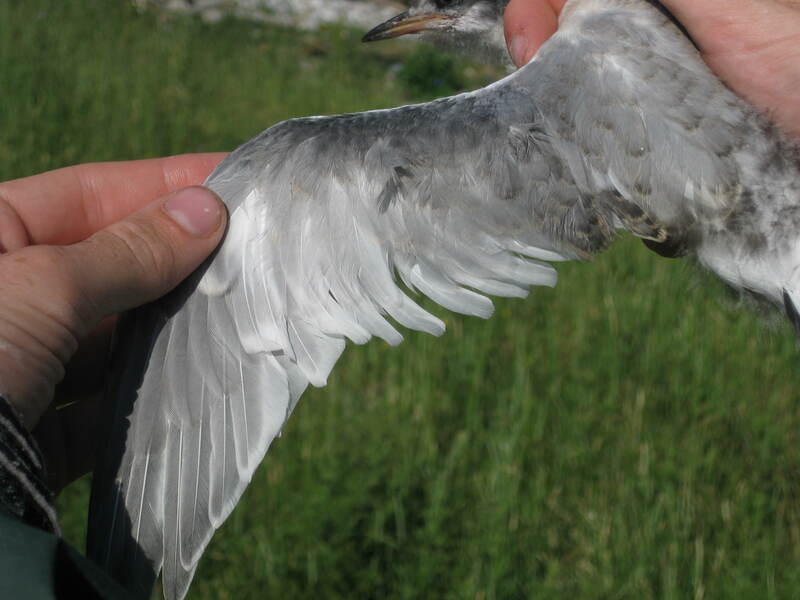 The Gulf of Maine Seabird Working Group (GOMSWG) census was started on June 17, 2011, and finished on June 20, 2011. The Tern nest count for the census was 484, with a Lincoln Index of 1.029, resulting in a corrected total of 498 Tern nests on the North End of Metinic. This represents about two thirds of last year’s population. 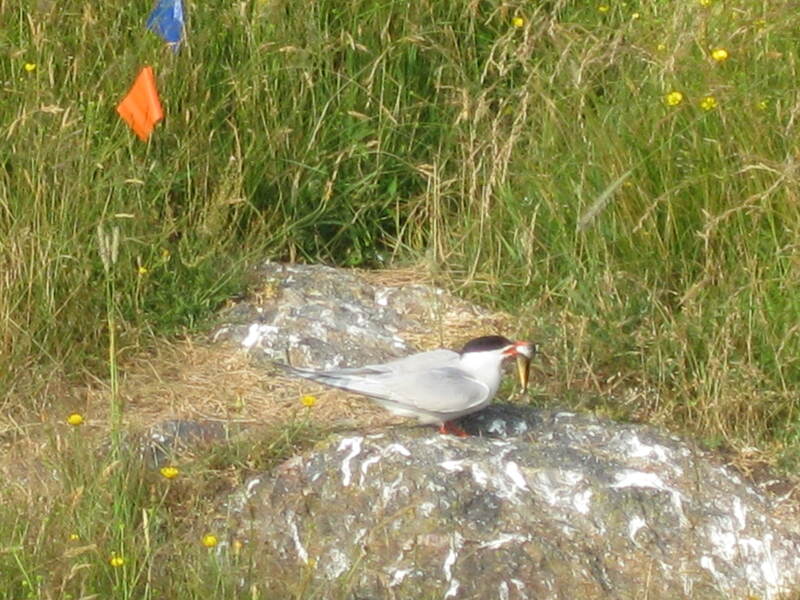 Common Tern nests were marked with a blue flag, while Arctic Tern nests were marked with a red flag. 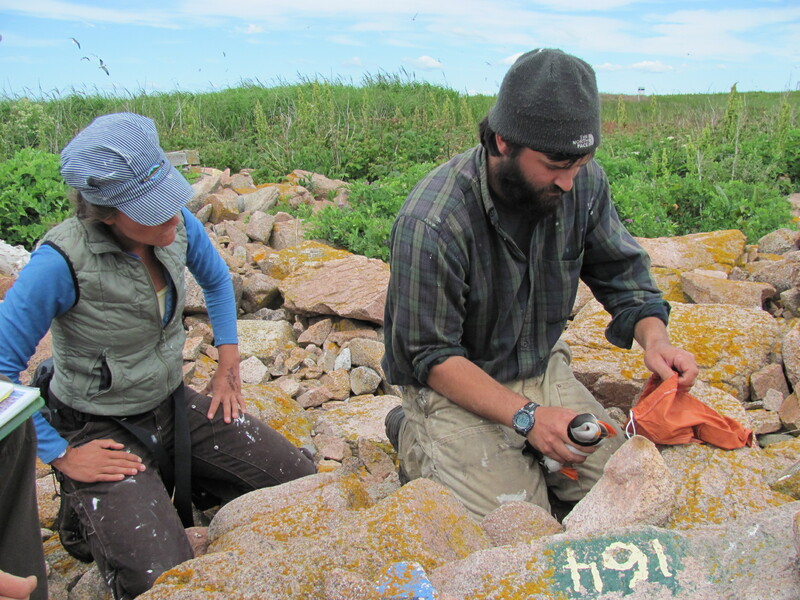 On the NE Point we identified 307 of 498 nests (61% of NE Point colony). We counted 122 ARTE, 185 COTE nests. We estimated that the colony was comprised of 40% Common Terns, 60% Arctic Terns. The South End of the island is privately owned and was surveyed by boat, 2 pairs of Terns were present, but no nests were confirmed. Fledging/reproductive success was low this year for Arctic Terns (under the 1 chick/nest USFWS goal), but Common Tern productivity improved from last year and met this goal. The Arctic Terns suffered from widespread predation events early in the season which resulted in the loss of many eggs and young chicks. We were able to follow 6 Common tern and 8 Arctic Tern nests throughout the season, for a total of 96 observational hours and 599 feedings. COTEs fed at an average rate of 1.6 feedings/hour, while ARTEs fed at 0.7 feedings/hour. Both Arctic and Common Terns delivered Atlantic Herring most frequently to their chicks consisting of about 55%and 30% of their diet respectively. Butterfish was the next most frequent delivery for both species, making up about 30% of deliveries. Herring deliveries gradually declined and butterfish deliveries gradually increased as the season progressed. Feedings overall slowed considerably starting in the third week of July especially for Arctic Terns. 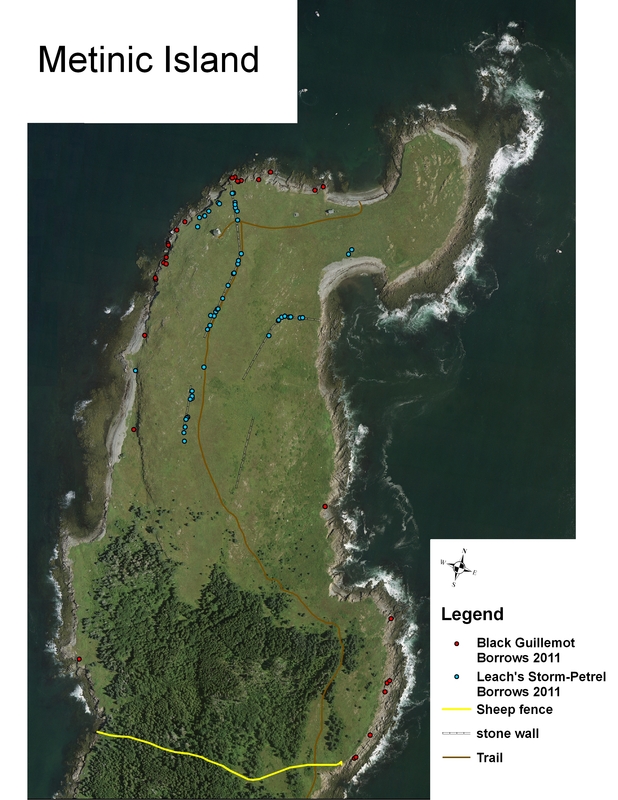 32 Guillemot nests were located with a hatch success of 62% and an egg depredation rate of 12.9%. 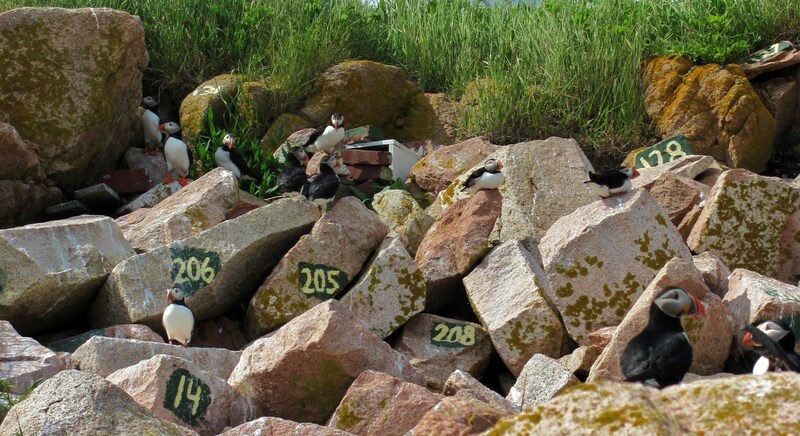 This data is not a complete set because of the number of guillemots incubating through all checks. Three adults were still incubating at the end of July, so hatch success could be higher than calculated. 19 chicks were found and 14 were banded, weighed, and measured. 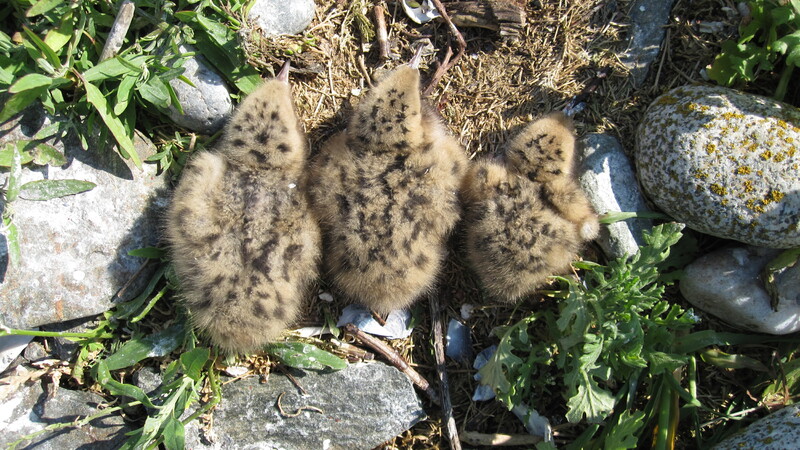 53 Leach’s Storm-petrel burrows showed signs of activity (smell, fresh piled dirt, activity at night) early in the season, however only 7 were noted to have eggs or adults present at the end of July. At the end of our field season, 17 burrows were no longer active and 29 still showed some activity yet nothing could be seen with the burrow scope. Eider numbers were very low this year averaging only 50-100 eiders at each morning count. Previous years Eiders had averaged between 150 and 300 for morning counts. 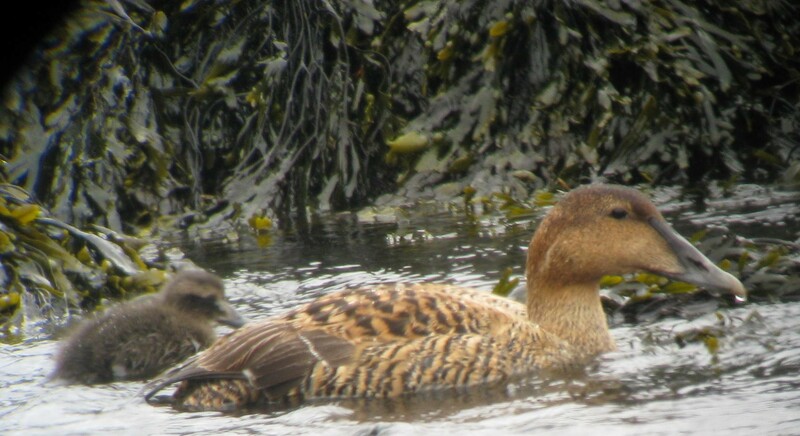 Only 30 observations of eider crèches were documented (at least 4 separate crèches). Five eiders were banded by USGS and MDIFW. Species highlights: Northern Gannett, American Oystercatcher, Razorbill, Atlantic Puffin, Whimbrel. We had a tremendous amount of fun out here this summer, and we hope you all enjoyed being able to follow along! If we peaked your intrest and you would like to get involved or support our efforts makes sure to check out the Friends of Maine Seabird Islands site: http://maineseabirds.org/html/home.html! Where have you been? Where will you go? For how much information they can hold, the geolocators are very small! 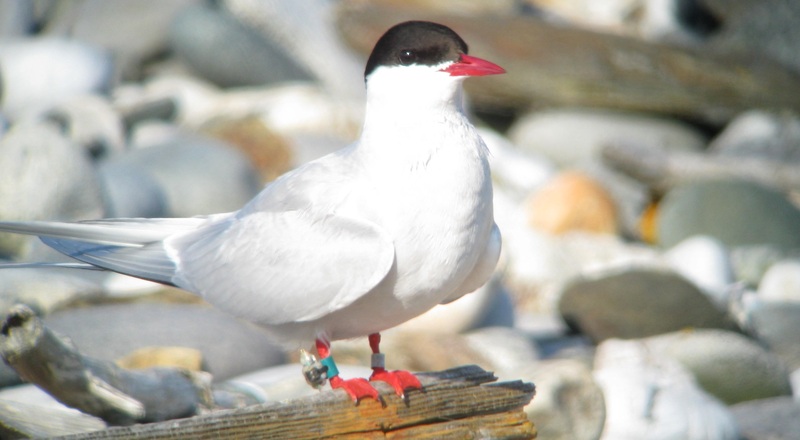 As the Terns get ready to migrate south at the end of the season, it makes you wonder “where are they going?” Last year on Metinic Island, refuge staff attached geolocators onto Arctic Terns in an effort to find out just that! These particular geolocators work in an incredible way. GPS or satellite tracking equipment is expensive and heavy. These lightweight little units monitor time of sunrise and sunset instead, and from that data can give an approximate location on the globe. This little device has tracked an almost 40,000 km round trip migration, we cant wait to see the map! 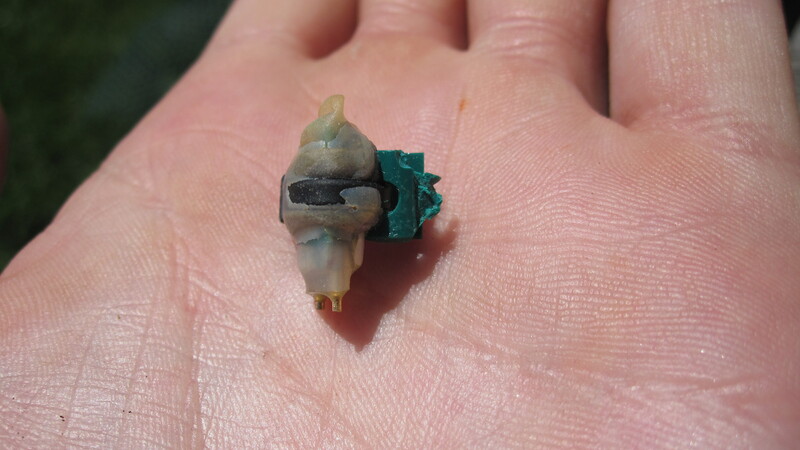 This year after a tremendous amount of searching, locating, and trapping, we were able to recover a few of the geolocators and are waiting to receive the data back from them. Soon we will have a map of the flight paths of a few Terns nesting on Metinic, and we will know not only where they went after last year, but how they got there! 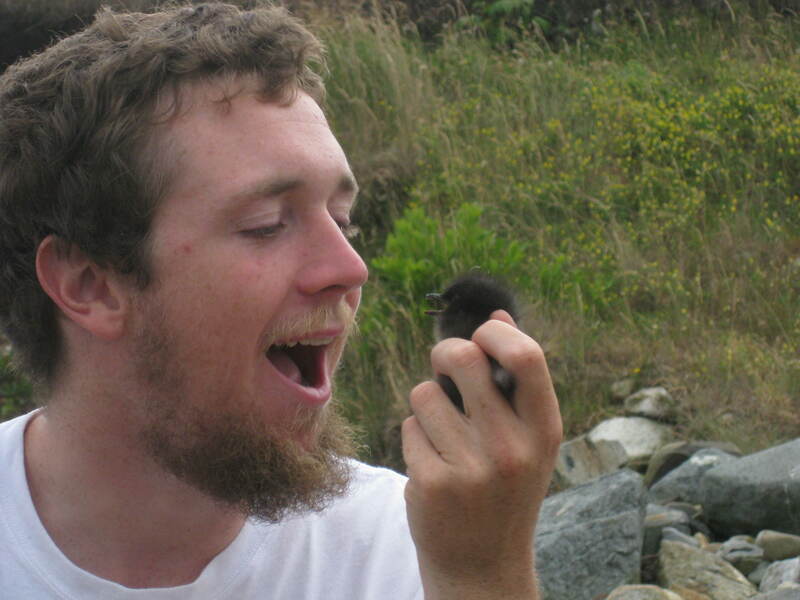 Today we started banding Black Guillemot chicks! 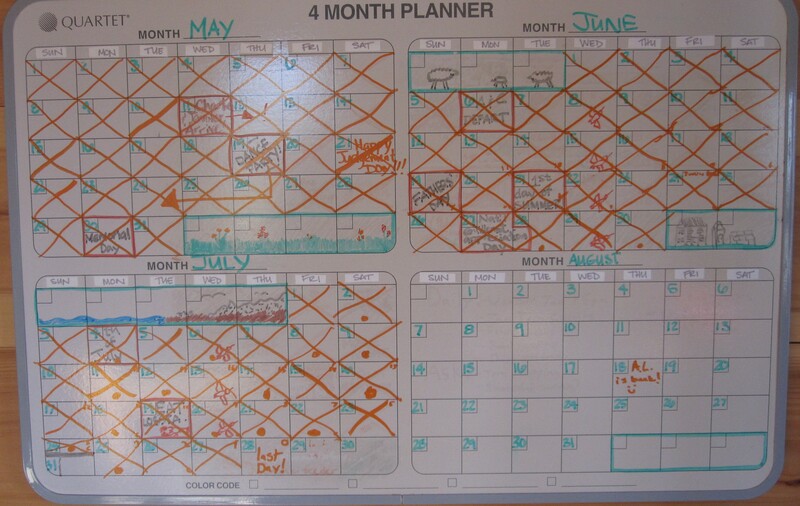 We have been waiting excitedly to start this, and could hold off no longer! 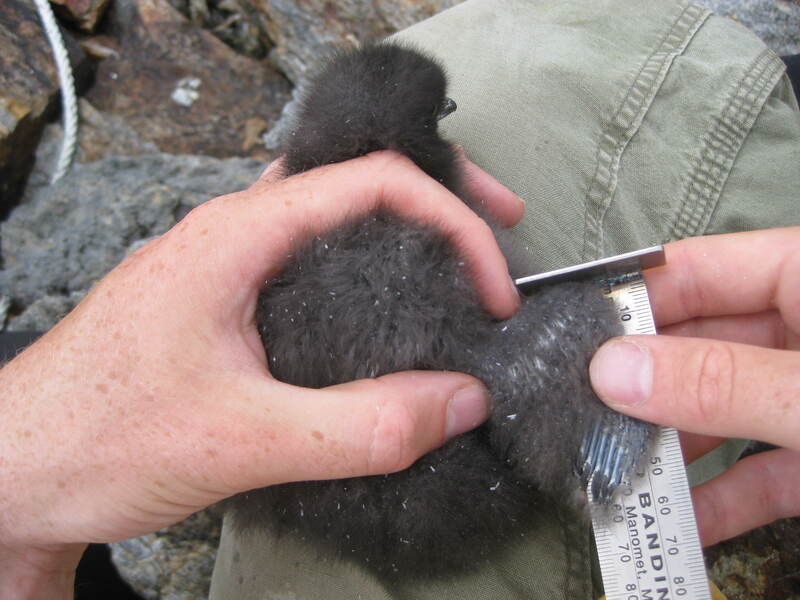 We had to wait this late in the season because Guillemot chicks take a size 4 band (2 sizes bigger than terns!) and we needed to find chicks that are old enough so the band will not just slip off. In addition to banding the chicks, we also weigh the chicks and take their wing cord length. These measurements will give us an idea as to if and when these chicks are likely to fledge. In the next couple days we will be checking all the burrows that had eggs in them for chicks. “Grubbing” chicks is almost like a puzzle; we have to figure out where the chick hid, and then how to maneuver our arms so we can reach into the burrow and grab the chick. This can be difficult as some of the burrows are very deep! 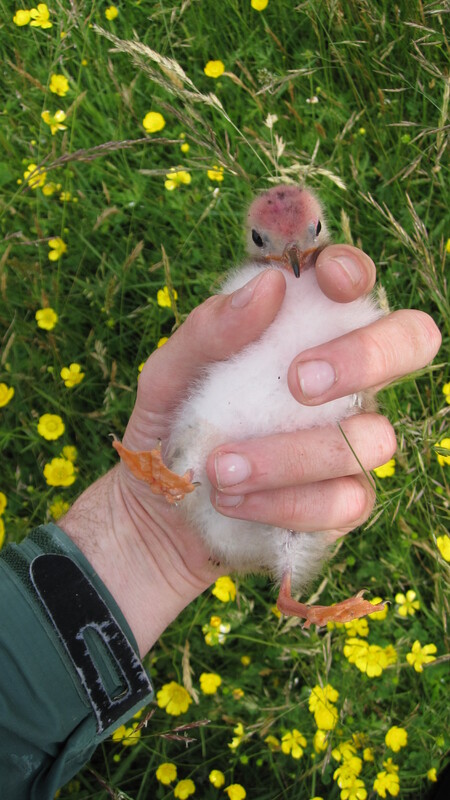 Our chick banding efforts will let us assess guillmont productivity this nesting season by comparing hatch and fledging rates to our original egg counts. Charlie thought they looked cute enough to eat, but swears the chick started it! Around the 4th of July, we began noticing puffins delivering food to their burrows, which can mean only one thing… chicks are hatching! Puffins feed small fish to their young. Here on Petit Manan, their diet mostly consists of butterfish, herring, and the occasional sand lance or hake. They can carry numerous fish in one beak load – as many as 10 – with the helps of backward-pointing spikes inside their bill and on their tongues. The record number of fish carried in the bill of a puffin is 62! 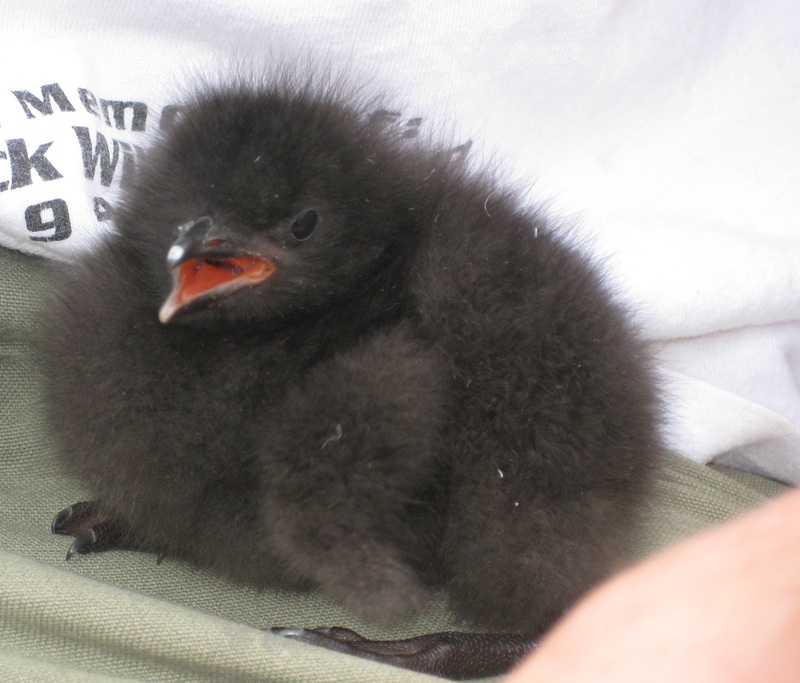 After an incubation period of around 42 days, puffin chicks begin to hatch. Each pair of puffins rears a single chick in a rock or sod burrow. The chick spends all of its time in the depths of the cool, dark burrow, until it is around 38 days old and almost ready to fledge. To get an idea of the number of chicks that are hatching and how their growth and development is progressing, two or three times during the season we go puffin grubbing! 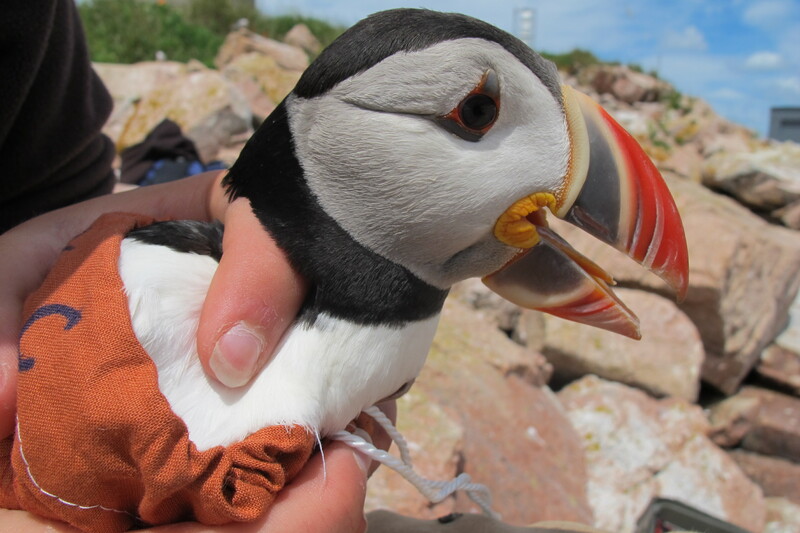 So far this season we’ve found 21 puffin chicks. 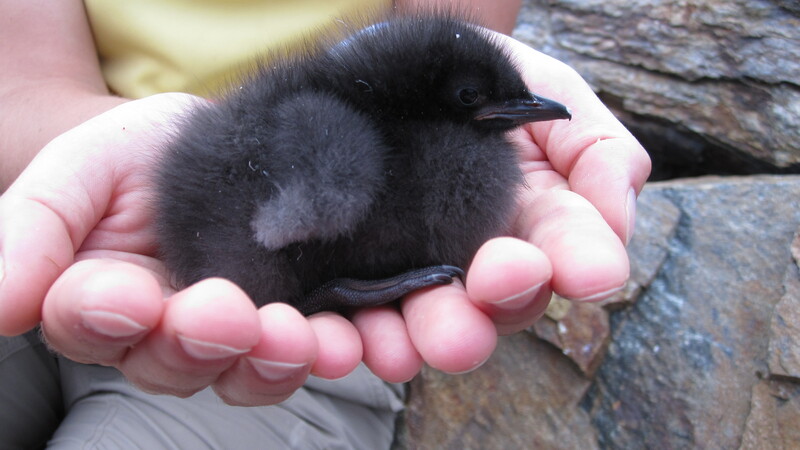 For the first few weeks, they’re hardly recognizable as puffins – they’re teacup sized fluff balls with dense, black, down. 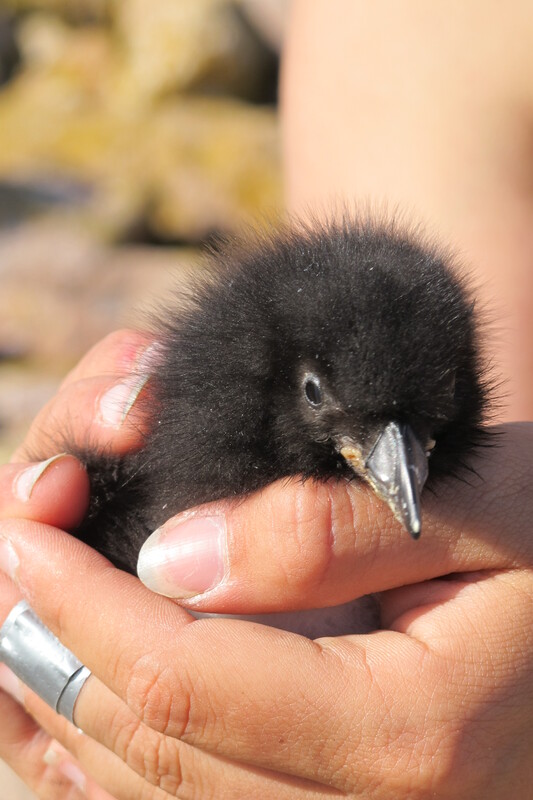 Unlike their parents’ colorful and elaborate bills, puffin chicks have modest, black bills that are reminiscent of a raven. Sometimes when we stick our arms into burrows we’re met with an unpleasant surprise: a sharp bite from the powerful bill of an adult puffin! We take measurements on the adults too: weight, wing and bill dimensions. And if they’re not already banded, we do that too. 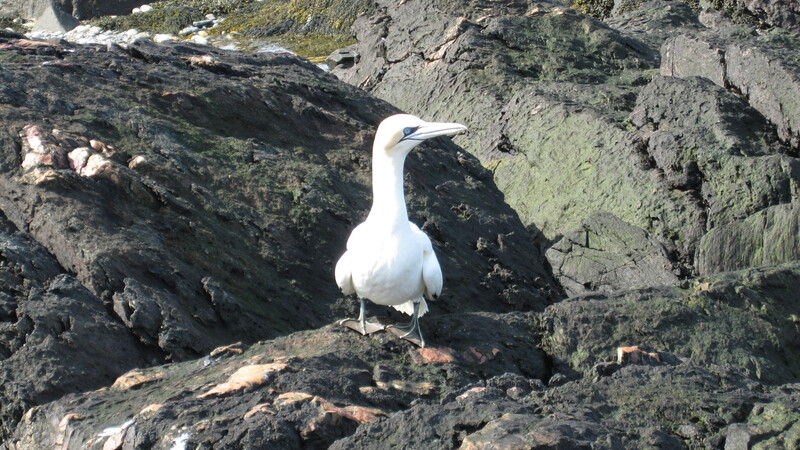 Check back soon for updates on our other Alcid buddies: the razorbills and guillemots! Fish! Its what’s for Dinnah! In order to tell all our chicks apart we color them with markers! Each nest is a different color, and then if there is more than one chick in the nest, the first born chick (the A chick) gets colored on the head, and the second born chick (the B chick) gets colored on the breast. It is quite entertaining to watch little brightly colored chicks run around! 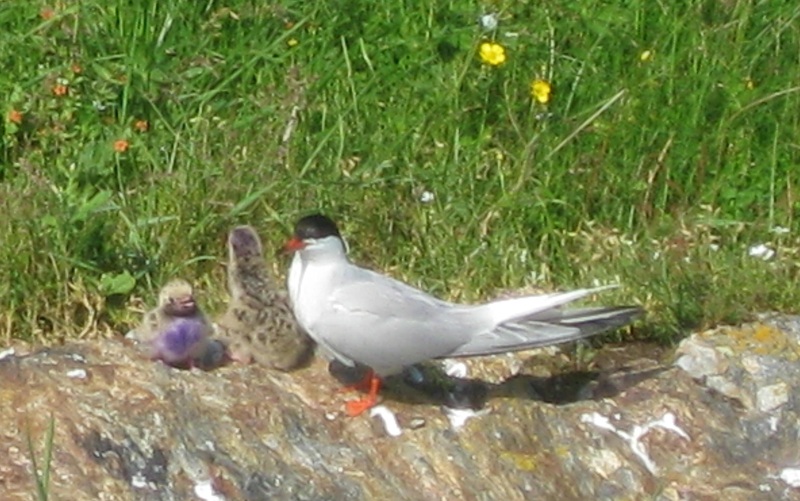 Two Common Tern provisioning chicks. The purple head denotes an "A" chick, and the purple breast is the "B" chick. One of the big challenges of provisioning is to correctly identify the fish species. This can be difficult since some of the feedings happen extremely fast! Those chicks are hungry! Some of our common fish are Atlantic Herring, Butterfish, Pollock, Sand Lance, Hake, Needlefish and a variety of invertebrates. 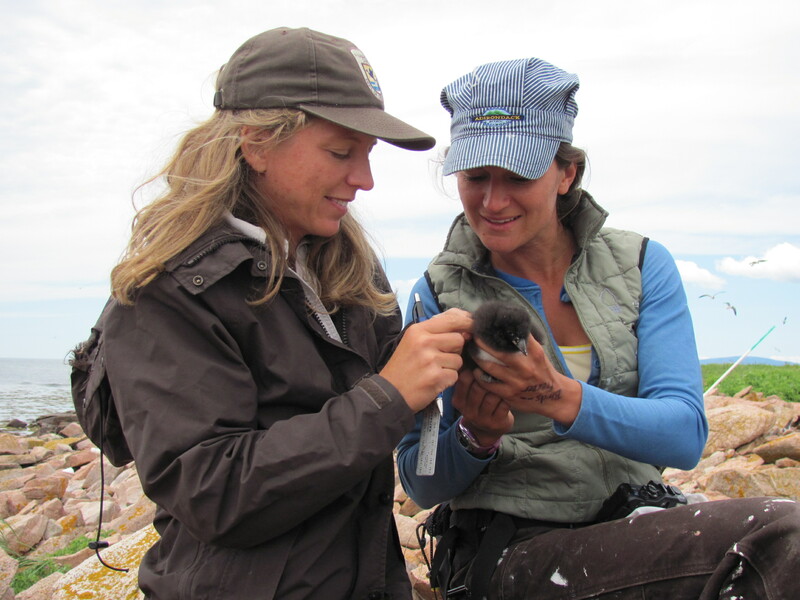 From our observations, we can analyze the chicks’ diet composition and feeding rate. I know we promised recipes, and there has only been one so far. The seabird work picked up pace quite quickly, and we have been so busy that we haven’t been able to post as much as we would like. Then our neighbor Eugene dropped off a 5 gallon bucket of crab claws. The feast that ensued definitely deserves a post. These crab cakes were well worth the three hours it took to pick the crab meat out! Sauté chopped onion, garlic and pickle until browned, then let cool. Combine crabmeat, ranch dressing, brown mustard, egg, 2 tablespoons bread crumbs and sautéed onion, garlic, and pickle and mix thoroughly. Form into 2 inch cakes, roll in the remaining bread crumbs, and then refrigerate for 2-3 hours before cooking. Pan fry on medium heat in olive oil until outside is a crispy golden brown. 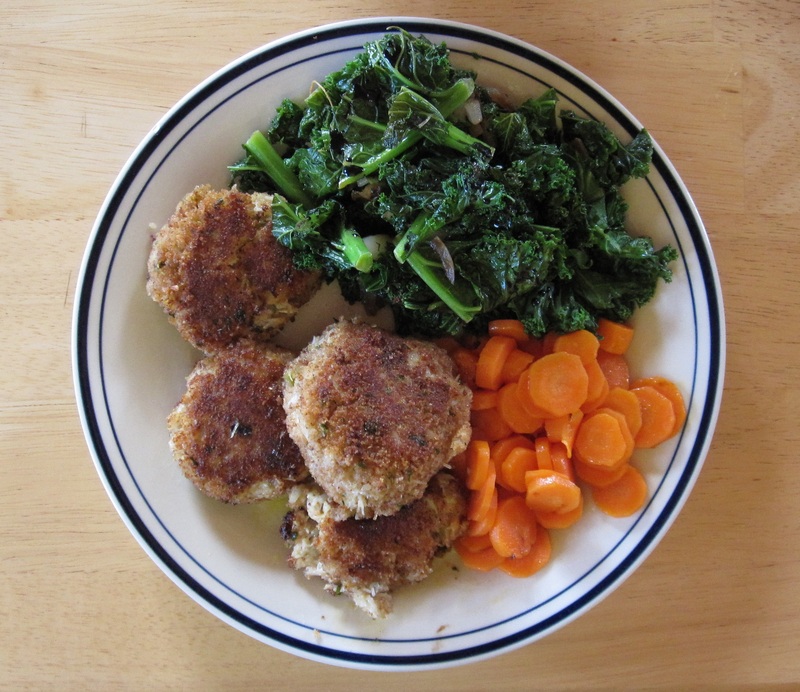 I served the crab cakes with sautéed kale topped with balsamic reduction, and candied carrots. Considering that these crab cakes used only about 1/5 of the crab meat, we might be having them again soon! Almost all of the fluffy down has been replaced with feathers, and he has gained the black cap adult Terns are known for. They grow up so fast! We spotted one of our Tern chicks in flight yesterday. It is really difficult to get a good picture of the little guy but as soon as we do we will post it! 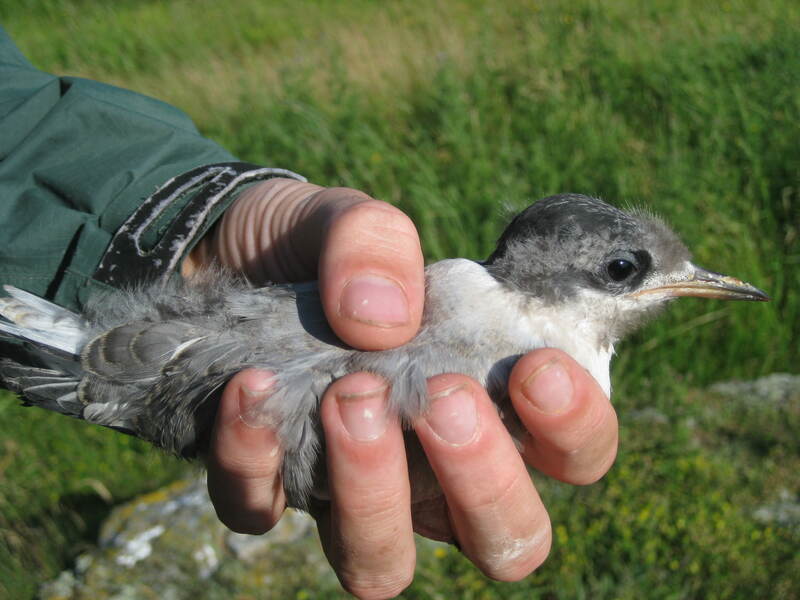 In the mean time here are two pictures of an Arctic Tern fledger we found while banding chicks across the island. He must be a day or two away from flying, and is the closest we will get to having our hands on a flyer! The flight feathers are now fully developed and any sign of sheaths has been preened out of the wing.